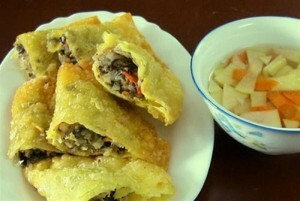 Foods on streets Hanoi become a part of gourmets, let’s see what could we eat with 10.000 VND in Hanoi. You will be surprise! 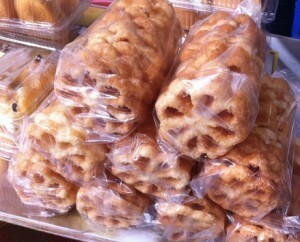 Only with 5000 for one cake, The main ingredients are banana, yam and flour then fry in cooking oil. They are fat food so you could only 1 – 2 cake for once. 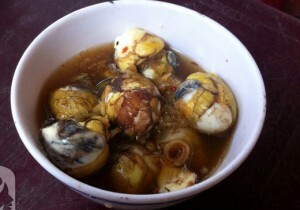 Have the babe duck in the eggs, a nutri-food but many foreingers and visitors dont like this food . 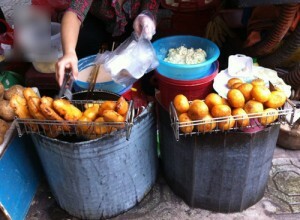 you can find them in Hang Rong shop on ervery streets of Hanoi for breakfast or super. 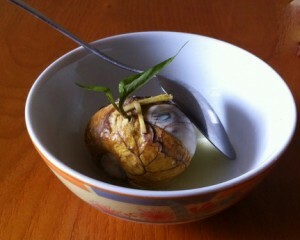 The price is about 6000 – 8000 VND, enjot with salt, ginger. 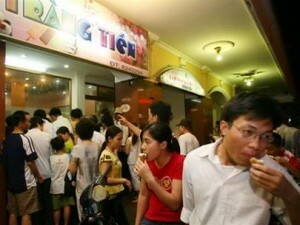 Trang Tien is the name of street and also the name of famous brand ice cream in Hanoi, everybody in Hanoi know about it. The old brand name for 50 years. 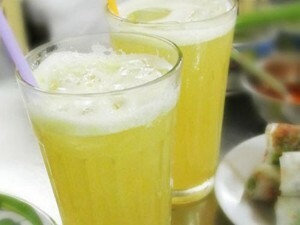 It’s not only cheap with price 7000 – 8000 VND and also special by its taste. 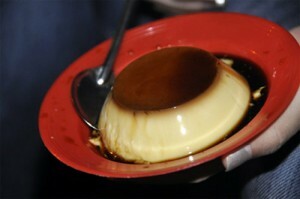 As its name, you can buy Trang Tien ice cream on Trang Tien street near the Sword lake. Don’t like any ice cream shop in Hanoi, you can buy ice cream, sit on your bike and enjoy, there is many couple and full of smile - a dating place, or hold your ice cream on hand and walk around the sword lake. 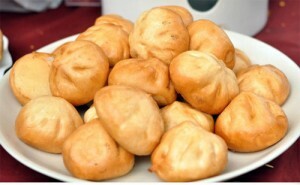 Favorite street food for girls and kids, less fat and can eat in a long time. The price is only 6000 – 8000 /pack. 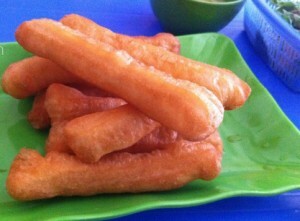 They are often made of flour or cassava flour then fry. 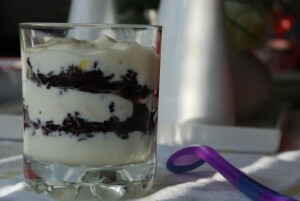 Food for ladies’s skin , the different from Hanoi with other region that they often add more ingredents in yogurt to create taste such as: fruit or Nep Cam. The price only about 5000 VND. Cool name huh ! 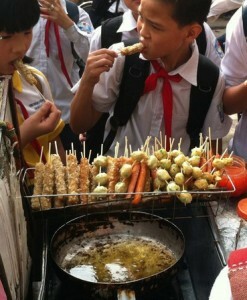 this new foods for kids, the price is about 10000 VND. 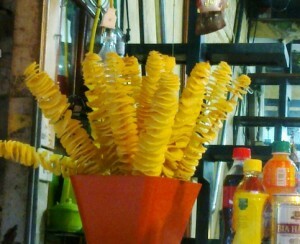 The tase like many kind of fried potato. 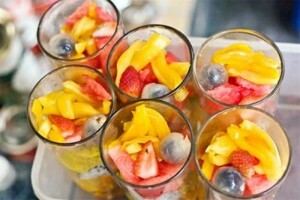 The main ingredients are sour and green fruits such as: mango, plum, guava fruit… slice and mix with sugar, pepper powder become attractive foods. The price is about 8000 – 10000VNd/100 gram – depend on the fruit price. 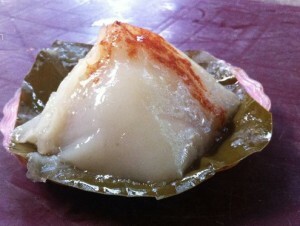 This is a unique food of Northern of Vietnam for Hot summer, the ingredient as tofu but near the last step to make tofu. 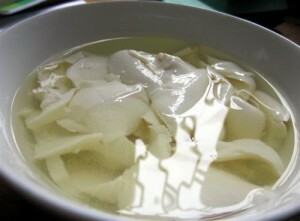 The saler will slice Tao Pho to bowl, then pour flower sugar and ice to make a bowl of cool Tao pho. 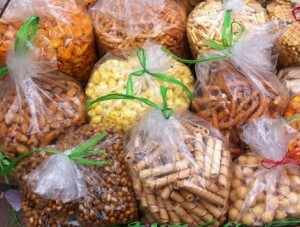 The price is about 5000- 7000VND/ bowl. You can find them on Hang Rong on streets of Hanoi with unique sound “ Tao Pho de”. 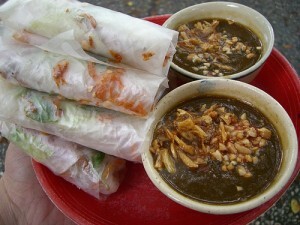 We are Hanoi food tour! 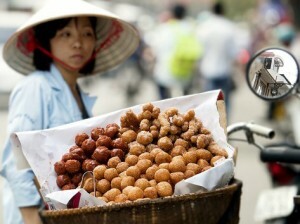 you can select foods or tell us where you want to go, we will discover with you by Hanoi people way. 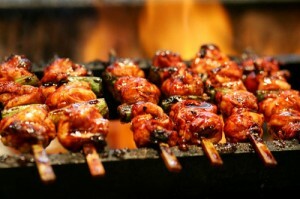 See street food tour!